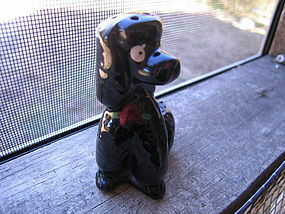 Vintage black poodle salt shaker. It looks like a red rose painted on chest. It is marked in faint print as manufactured in Japan. The material reminds me of redware. Has the original cork stopper. The height is 3 1/8 inches. There is very little loss to the finish and no chips, cracks, breaks or repairs. The pepper shaker is available. Will provide larger photo by email for identification purposes. I need your zip code to calculate the postage.